A little while ago we did an article on Hidden Masters. In that piece we were talking about some of the teachers who have retired from view. Here, with wry humor, Gary Shapiro reminds us that surprises are all around us. I was asked to visit Betty and evaluate whether she would benefit from having grab bars installed on her her bathtub wall. Because of chronic emphysema, Betty found herself becoming more sedentary She felt her legs getting weaker and her standing balance declining. Betty began to question her ability to safely step over the side of her bathtub to shower. I called her to schedule my first visit. With the exception of shortness of breath, Betty, who was 86 sounded alert and vibrant. My impression proved right. She greeted me at her door wearing a nasal cannula with 50 ft of tubing attaching her to a portable oxygen generator. This set up allowed her to walk through her entire home with a continuous supply of oxygen. Betty walked briskly. All of her movements were short and rapid. She reminded me of a flitting humming bird. When I “foolishly” suggested that she slow down a bit, she gave me the response that I heard many times in the past: “I can’t help myself, I’ve always been like this, even before I got sick!” It was as if she knew that she had to complete whatever she was doing before becoming breathless. This is the worst thing to do and becomes a self fulfilling prophesy—move faster and become breathless sooner. Betty was one of our “frequent fliers”. She had been on our program for quite some time. A succession of nurses and physical therapists had passed through her door. She knew all the things she was “supposed” to do. After completing my evaluation for the grab bars I asked if there was anything else that I could do to help her. She showed me sheets of exercises from different physical therapists—exercises that she was “supposed” to do. Then, in passing Betty mentioned that she had studied Tai Chi some time ago. I told her that Tai Chi was perfect for her, it addressed balance, leg strength, breathing, etc. She said that she gave it up for two reasons: her breathing became more difficult, and, her group disbanded.. I asked her to show me some “moves”–cloud hands to start. She hesitated at first, being somewhat embarrassed. I had to gently coax her. She did a few rounds with extreme precision, and of course, rapidity. She stopped abruptly because of the usual breathlessness. She was frustrated. “You see? It’s the breathing! It won’t let me do it!” I suggested that she slow down and concentrate on quality rather than quantity. I was very impressed, to say the least. This was not a typical senior citizen who enrolled in an adult education class in some high school gym. Her form was impeccable. The only flaw besides that rapid pace was her raised shoulders. “I know, they were always correcting me in class!” I explained that the elevated shoulders were due in large part to her high chest breathing, a trademark of emphysema. I could have discharged her at that point. Instead, I decided to visit her a couple of more times, to see if I could motivate her to resume her practice. I reviewed diaphragmatic(belly) breathing combined with slow exhalation, a practice that was essential for her. I tried my best to encourage her. “Betty, you have more at your command than most physical therapists do”, I said. “All you have to do is slow down and try to practice—and be more patient with yourself.” Before I left, she gave me an instructional Chi Kung video that her school had produced. She was interested to hear my opinion. I promised to view it before making my next visit. I made an inroad. The video was professionally done. I thought it might be a good re-entry point for her. She was glad to see me again. I told her my thoughts about the video, and she agreed. We did a few movements common to Yang forms—push, roll back, etc. She had learned the “24” form and started to show me, but again, too fast, and quickly out of breath. She started learning the long form and dabbled with the sword and push hands. 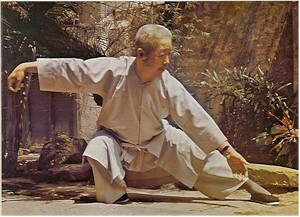 When asked, I told her that I had been practicing the Chen Man Ching form for quite some time. She said that she had seen a video of the Professor and was very impressed by his “simplicity and power”. I was in the presence of a Tai Chi connoisseur! I tried to “dazzle” her with a some Chen silk reeling. “Oh yes, we did that too”, she said. Then, out of nowhere Betty did a double serving tea cups—without spilling a drop! Bagua! Who was this woman? What galaxy was she from? I had one more visit to make. It would be my last chance to convince her to resume her practice. I thought about how impressed she was with Prof. Cheng. I had Benjamin Lo’s instructional video of Cheng’s form. Ben was one of his first students and learned the “old school” way, by holding individual postures for agonizingly long periods of time. He definitely “ate the bitters”. I still vividly remember his form correction workshop nearly 25 years ago. I had sore knees for weeks after and left extremely depressed, convinced that I was a rank beginner, even after ten years of practice. This video was hardly a Terry Dunn “Tai Chi For Health” production (Betty had both the long and short form versions), with music by Vangelis and Big Sur in the back round. It was taped in a sparse studio, the only enhancement being a lone potted tree, standing against a wall. At a Chi Kung workshop, Terry told me that he he offered to help with the production values, (he laughed about the tree), but Ben politely declined the offer. I brought the video to our last visit, with the hope of really inspiring her. Betty watched with laser-like focus.”Look at how he coordinates his hand and foot movements! You can really see where his power comes from!” She went on and on, pointing out things that I wasn’t aware of. When Ben did the lotus sweeping kick near the end of the form, she smiled and said, “That was cute!” I never heard it described in such a way, and I doubt that Ben had either. Betty had a broad smile on her face when the tape ended. “I really want to start again”, she said enthusiastically. It appeared that the tape was the just the right catalyst. I hadn’t shown Betty anything new. I only helped her recall what she had forgotten. Now, it was up to her. Posted November 3, 2009 by Gary Shapiro, PT. Comments and trackbacks are open. Follow the comments feed. Tagged with: Ben Lo, Cheng Man Ching, qigong, taiji, Terry Dunn. It blessed my heart to read about someone who took the “gentle arts”, so to speak so seriously, and inspired me to resume my own Tai Chi training (I’m pursuing Chen style). I’m appreciating how the author encouraged her to go back to practice for improvement of the quality of her life. Thanks.